What Is the Effect of Aging on Liquor? Much like a child matures over time, whiskey, brandy, and other aged alcohols become more refined as they spend years resting in a barrel. The aging process is vital to many styles of liquor as it gives them the color and flavor we expect. Aging is the process of storing distilled spirits (or wines) in barrels for a specific period of time. The goal of maturation is to remove harsh flavors from the raw alcohol while adding distinct flavor characteristics found in the barrel's wood. The barrels, or casks, are often made of oak, which is sometimes charred. Other woods may be used, and each type of wood used plays a large role in determining the final flavor profile of that particular spirit. Brandy and whiskey are the most common liquors that require aging. Many styles are required to spend a minimum amount of time (typically 3 years) in barrels prior to bottling. Many rums and tequilas are aged as well, though aging is not a requirement for all styles of these liquors. Higher quality spirits are aged for a longer period of time and have a price tag to reflect this extra mellowing time. For instance, a 50-year-old scotch will be more expensive than a 10-year-old scotch. The workers who build and repair barrels are called coopers. Some distilleries have their own cooperage to make their barrels while others use the services of a business dedicated to building barrels. As an alcohol enters the barrel it is clear and relatively flavorless, much like vodka. During its time in the barrel, it will pick up flavors and colors from the wood and become the dark spirit we are familiar with in the bottle. First, you will notice that aged liquor is darker than unaged liquor. Think about it: whiskey has an amber or golden brown color while vodka is clear. This is because (most) whiskey is aged and vodka is not. There are exceptions to this and in the world of whiskey; moonshine is a perfect example because it is unaged whiskey. Pisco is another example as this brandy cannot, by law, be aged in wood. Both moonshine and pisco are clear and colorless. More important than the color is the flavor that is added to aged spirits. At the same time, this 'flavor enhancement' mellows out any harsh notes found in the distillate (liquor straight out of the still). You will often read whiskey reviews that talk about an 'oakiness' or 'undertones of charred oak.' As the spirit is in contact with the wood, it pulls out some of those woody flavors. It is similar to grilling salmon on a cedar plank. Depending on the wood used in the barrel, you will get different flavors. Woodford Reserve's Master Collection of bourbons is a great example of this. Every year the brand releases a limited edition of the whiskey and the difference is often as simple as the finishing barrel. For example, they will take the same aged bourbon we enjoy every day and place it in a special barrel to 'finish' it. The Maple Wood Finish from 2010 was decidedly sweeter than the Seasoned Oak of 2009. The barrels for the 2009 whiskey were charred then set outside for 3 to 5 years before filling. 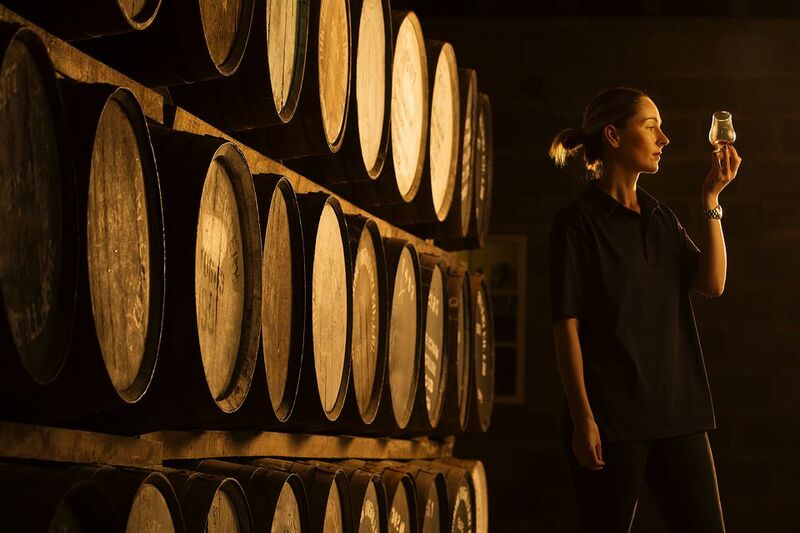 The resulting bourbon was far more complex than anything Woodford had produced to date because the wood itself had gone through so many seasonal changes. It is common for distilleries to play with the types of wood used in their barrels and enthusiasts often look forward to the new tastes. The liquor's flavor will also be affected by the previous use of the barrel. Barrels that previously aged sherry are common in whiskey aging, especially with scotch. These whiskeys may have a sweeter, wine-like tone in the flavor. Bourbon can only be aged in a new barrel, so they are unusable by the distillery after the first batch. Many tequila, rum, and other whiskey brands will buy these barrels for aging, giving their spirits flavor notes reminiscent of bourbon. Brands like Novo Fogo Cachaca make a point of using exotic woods in their barrels to create distinct expressions of their distilled spirits. You should get excited when a brand tries to show off a liquor aged in a new barrel, especially if it's one of your favorites. You should try the new-barrel-aged spirit against the standard bottling. It will give you an entirely new appreciation for the effects of aging. Unlike wines, distilled spirits do not improve with age once they are in the bottle. As long as they are not opened, your whiskey, brandy, rum, and the like will not change and they will certainly not mature further while they wait on the shelf. Single malt scotch and Irish whiskeys must all be aged for a minimum of 3 years. Añejo tequila must be aged for at least 1 year but no more than 3 years (after 3 years, it is considered an extra añejo). Other spirits, such as rum, have no requirements for aging. Vodkas and gins are typically unaged. Many times, especially in the case of whiskey, the label will indicate the liquor's age. This is particularly true when the brand wants to show off how old the bottling is. Other labels do not indicate an age at all. This is often because the distiller relies on a general aging time, and will fine tune it according to taste. A fine example of this is Maker's Mark, which is aged for nearly 6 years. At that mark, it is tested and aged further if needed or, according to the brand, "until it is fully matured." If a blended liquor (rums and whiskeys are most common) is marked with an age statement on the label, it typically indicates the age of the youngest liquor in the mix. For instance, the Chivas 25-Year-Old Scotch bottling is comprised of a blend of different whiskeys that have each been aged for at least 25 years. Some of the whiskeys used may be older than that. Why Is Whiskey Aged Longer Than Rum and Tequila? Why don't we see many 50-year-old rums or 20-year-old tequilas? The simple answer is climate. Think about the climate differences between major whiskey regions like the United States, Canada, Ireland, and Scotland versus Mexico where tequila is produced and the Caribbean and South America where the majority of rum is made. The climate of the region is the main factor in how long a spirit needs to be aged to its optimal potential. In hotter climates, the aging process is naturally sped up so it is unnecessary to keep tequila or rum in barrels for more than a few years. Tequila reaches a peak at around 2 to 3 years and rum averages about 8 years. In the case of rum, the time is going to depend significantly on the location where it is produced, which can be anywhere in the world. A rum that is aged in New England may need 2 to 3 more years in the barrel than a rum aged in the Caribbean. In contrast, the majority of whiskey and brandy distillers are located in the northern hemisphere in locations that experience significant annual shifts in temperature. The extreme cold and heat along with mild periods in between require a longer time in the barrels in order to obtain the correct mellowing and barrel notes in the whiskey. You will notice that the more northern the whiskey, the longer it is aged. That is why it is not uncommon to see scotch that has been aged for 25 years while the best bourbons may only spend 7 years in the barrel. Even a barrel's location inside the rackhouse (where the barrels are stored during aging) can affect the liquor. Many distilleries choose to rotate the barrels from the top to the bottom over the years because of the different temperatures found inside these warehouse-sized buildings.